Monday, 8th of January, 2007, Helsinki. Yes, this new page means that I was in Japan last autumn (from the 31st of September to the 22nd of October 2006). I had tickets bought from Finnair way back in April 2006 for a three week visit and after almost six months of waiting, I visited Japan for the third time. This trip differs most from the previous ones by staying with a Japanese couple for a few days and having some basic Japanese language skills, which obviously made quite a difference when communicating with the Japanese people I met during my travels. Furthermore, I didn't buy the JR Rail Pass as I wasn't going to travel widely enough to make it worth it budget-wise. New locations include Kanazawa, Toyama and Matsumoto. All in all, this was in some ways the best vacation I've had in Japan so far. So will we be seeing a new travelogue? Oh dear, I'm afraid this is where the bad news comes in. As much as I'd wish it could happen as quickly and painlessly as possible, I know from experience it won't be anything like that. Writing yet another report is a time consuming process, which eats up a lot of free time. I'll try to come up with something as the months go by, but I won't be writing a day-to-day travelogue as the previous two, but probably more of a location-to-location format. I think this approach will be better since I find little need to repeat the small detailed routines I've written in the previous travelogues. Maybe some might feel I've lowered my standards, but I think it still is better than nothing (that said, I'm still thinking should I do it at all!). I hope you agree and understand this decision. After days, months, and now almost two years, it is quite obvious that there will be no Solo Japan III. Sorry about it. But at least there is the Flickr-gallery of the trip, so the trip is still documented in some way. 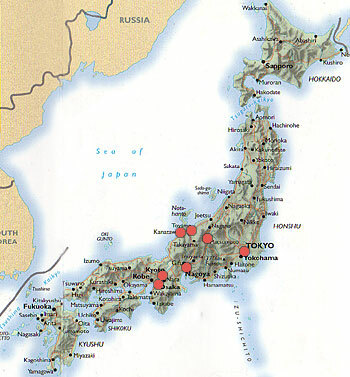 The red dots show the locations I visited (Osaka, Kyoto, Kanazawa, Takaoka, Toyama, Matsumoto, Tokyo and Nagoya). Air flight tickets: Finnair direct flight (Helsinki-Osaka, Nagoya-Helsinki). Train (local, express and shinkansen) and bus tickets. Food, entry fee tickets, lenses for camera, souvenirs (! ), etc. Note: exchange rate during this trip was about 145 yen per one euro. Here is a photo gallery I put up of the trip. I hope you like it!